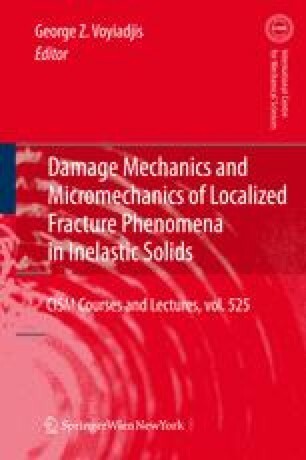 In this work also the mechanics of small damage are also presented using a consistent mathematical and mechanical framework based on the equations of damage mechanics. In this regard, the new scalar damage variable is investigated in detail. The investigation in this work has been carried out for seeking a physical basis is sought for the damage tensor [M] that is used to link the damage state of the material with effective undamaged configuration. The approach presented here provides for a strong physical basis for this missing link. In particular, the authors have made an important link between the damage tensor and fabric tensors. Computational aspects of the presented theory are also discussed. Numerical integration algorithms, verification and validation process of the theory are discussed. The finite element simulations are also performed by implementing the presented model in the commercial finite element code ABAQUS [6.8.3] as a user defined subroutine (VUMAT).